There’s nothing Qualcomm likes more than a good old patent scrap, but the cost of them is starting to take its toll on the bottom line. Qualcomm’s recent quarterly numbers made awkward reading, if you looked at the GAAP (generally accepted accounting principles) table, rather than the non-GAAP one (see below). Revenues were down 10% year-on-year and net income was down 36%. The reasons for this were the following one-off items included in the GAPP numbers but not the non-GAAP ones. A $974 million reduction to revenues due to an arbitration ruling against Qualcomm regarding historical BlackBerry royalty payments and the $868 million fine imposed on Qualcomm by South Korea. 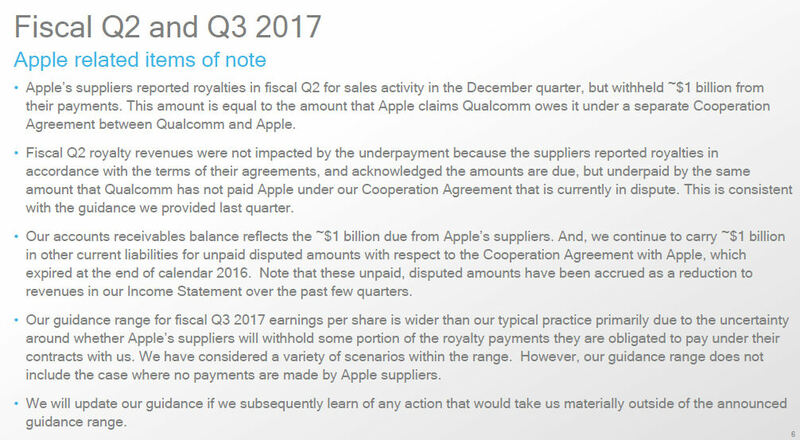 On top of that Qualcomm warned that future quarters are likely to be negatively affected by its ongoing patent agro with Apple, as per the slide below. Qualcomm’s shares have held up in spite of these costs and the outlook warning but if the Apple case starts heading in the wrong direction that could change quickly. In other news Qualcomm announced it’s working with Facebook to enable machine learning processing on mobile devices, thus taking some of the burden away from the cloud. At its recent F8 conference Facebook spoke about the Caffe2 deep learning framework, which it made open source. Qualcomm is optimizing Caffe2 for its Snapdragon neural processing engine.